Yesterday, to kick off the COP24 climate change summit in Poland, the World Bank announced plans to increase climate finance. Notably, they spoke explicitly about the need to fund climate change adaptation, resilience and disaster risk reduction. For the first time they are giving adaptation and mitigation ‘equal emphasis’. It is welcome news and we explain why below. Since the Paris Agreement in 2015, we’ve seen climate finance from both the public and private sector, fluctuate around $380bn per year*. In 2016, climate finance totaled $383bn globally ($282bn from private actors; $141bn public actors)**. Private actors pretty much only finance climate change mitigation programmes. They make investments (with varying degrees of risk and certainty) in things like renewable energy to help slow climate change down while also making a financial return. COP 21 in Paris was noteworthy in that adaptation and mitigation were given equal prominence (in principle at least) as part of the pledge made by developed nation states to create $100bn per year of climate finance by 2020. There are all sorts of political reasons for this balance, relating to global power structures between developed and developing nations. Up to point (in time) this balance does make some sense - if we had successfully mitigated climate change, we wouldn’t need to adapt to it. However, as climate change begins to impact more and more the logic breaks down. It will cost more to repair the damage caused by climate change than it will to adapt to it and limit the extent of that damage. At COP 24, developing nations, like Nepal, will be calling for a re-balancing of the climate finance directed at adaptation and mitigation. Currently then, only around $25bn (less than 20%) of public finance for climate action is going to climate change adaptation each year. If we look at climate finance as a whole (around $380bn / year), the percentage of climate finance available for adaptation is approximately 6.5%. Only 6.5%! $25bn is a paltry amount (less than $4 per person per year), that is probably not even enough for Nepal’s adaptation needs, let alone the entire globe. For some context, $558bn was spent on advertising in 2018 ($76/person). When it comes to climate finance, the World Bank is one of the globe’s most important ‘public actors’; probably the most important, where it leads others follow. The commitment it is making to increase climate finance is good, but the statement they are making in proportionately increasing the amount going to adaptation is even better. The World Bank has sent a signal. As their hashtag puts it #AdaptationMatters. We hope other public actors (and maybe even some private actors) will take notice and up their commitments too. You can read more about the World Bank’s statement in their press release, their Adaptation and Resilience Action Plan or in The Guardian. 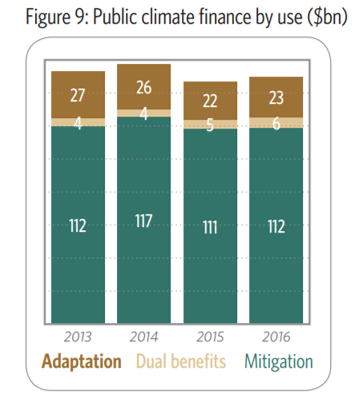 The World Bank financed $7.7bn worth of climate change adaptation work in 2017. In 2021-25 they will up this to $10bn per year. ** It is not enough. Over $1 trillion per year is needed avert catastrophic climate change and social collapse, but we won’t get into that here. *** If you are a TGT donor you are contributing to this pot. Thank you.